Grand Machinery Exchange was in business in this area of Manhattan from 1927 until 2006, when they left for Long Island. According to Andrew Jacobs, writing in the New York Times, 7 Feb. 2006, the owner at that time, Larry Goodman, was the third generation of Goodmans in the business at this location: "Mr. Goodman, whose grandfather started selling second-hand metalworking machines on Centre Street in 1927, recalls a gritty world that buzzed with riggers, repairmen and buyers haggling over Volkswagen-size contraptions... Long before luxury lofts ... there were the bronze forgers, the book printers, the food canners and the garment makers. Until the 1950's, when the industrial lifeblood began to ebb away, vast stretches of Lower and Midtown Manhattan were given over to a vertical city of foundries and factories that employed hundreds of thousands." The founder was Jacob Goodman (1886 or 1887-1980). The date of birth is uncertain. When he registered for the World War I draft in 1917, he gave 5 July 1886 as his date of birth. Then in 1942, registering for the World War II draft, his birth date is 23 April 1887. Another variant is carried on his Social Security records, where date of birth is 20 April 1887. Place of birth also differs on the draft registrations. His World War I draft registration says he was born in Warsaw, Poland. The 1942 draft registration says he was born in Klembov, Poland. Possibly this is Klebow, 129 km. southeast of Warszawa. Jacob Goodman appears in the U. S. Census of 1930, living on New Lots Ave., Brooklyn. He was 43 years old, born Poland, immigrated 1911, Alien, Retail Merchant, General Machinery. His wife, Bertha, 42, was also born in Poland and immigrated in 1913. The children include Samuel, 22, and Pauline, 20, who were born in Poland and immigrated in 1921. Four other children, Anna, Isidore, Henry and Jerry, were born in New York. Jerry Goodman (1924-2001) was to become the second generation owner of Grand Machinery Exchange, and father of Larry Goodman mentioned above. Jacob Goodman also appears in the 1920 U. S. Census, living at 842 Dumont Ave., Brooklyn. With him were Bertha and only two children, Isidor and Henry. Presumably, the older children were still in Poland at this time. In this census Jacob gave his occupation as "Moving Van, Moving Co." And he was listed in several sources as a truckman at 235 Centre St. between the years 1917 and 1925 before changing to machinery at this same address around 1925/26. 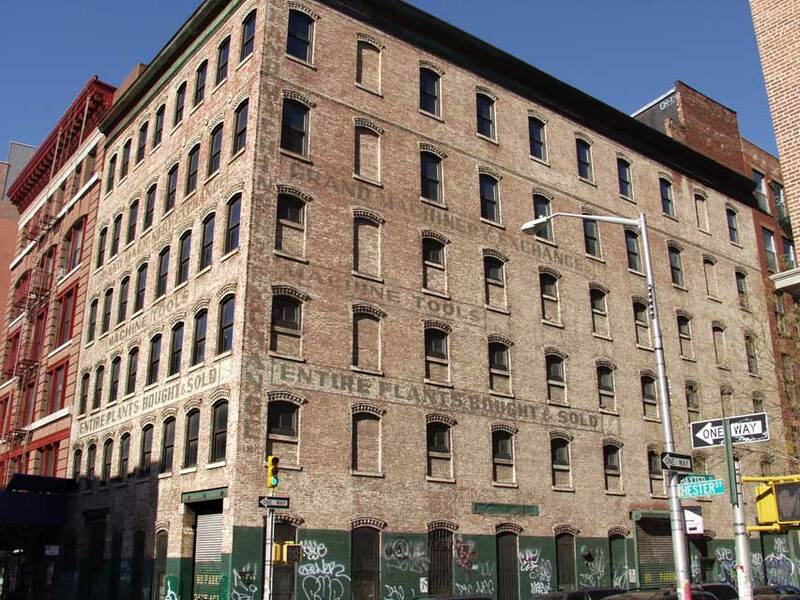 This building on the corner of Hester & Baxter was used by Grand Machinery as a storage warehouse. Their store (from the early 1950s until closing in 2006) was located around the corner at 215 Centre St. This sign appeared in the window at 215 Centre St. in 2005. They also had a branch store at 147-151 Lafayette St. This sign was in the window at 147 Lafayette in 2005. A very faded sign on the wall at 147 Lafayette St. seemed to say, "Tools Bought" (Click for image). Grand Machinery Exchange is currently (Feb. 2009) in business in Hauppauge, N. Y. on Long Island.